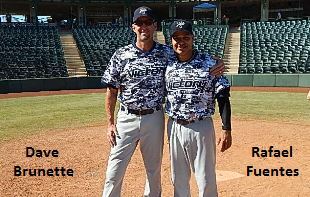 January 18, 2016, Palm Springs, CA – Despite trailing by five runs in the second inning Team Victory defeated the Team Waikiki Beach Boys10-7 to win the championship of the 50 National Division at the MSBL Desert Classic held in Palm Springs, CA. The Beach Boys scored five runs in the top of the second to take an early 5-0 lead, however Team Victory slowly chipped away by scoring a run in the bottom of the second when Tim Lockhart led off with a walk, followed by back-to-back singles by Doug Thigpen and Bob Pone scoring Lockhart with the team’s first run of the game. In the bottom of the fourth, Team Victory tied the game with a four-run inning. Frank Bons led off with a double, Lockhart and Dale Ebby followed with back to back singles which produced a run, then two batters later Thigpen broke up a double play which resulted in another run. Pone singled and then following a fielder’s choice by Raphael Fuentes, the score evened up at 5-5. In the bottom of the fifth Team Victory took the lead 7-5 following a leadoff single by John Knoblah, Manny Salinas then moved him over to second, John Love singled to give Team Victory a 6-5 lead, then Bons singled in Love to make it 7-5. After the Beach Boys scored in the top of the eighth to pull within 7-6, Team Victory added three more runs in the bottom half of the inning to put the game away. The Beach Boys rallied in the top of the ninth scoring a run and loaded the bases with two outs before Team Victory was able to get the final out and hang on for the victory. For the Beach Boys, the were led offensively by Jorge Flores who went 2 for 4, Jose Ibarra went 3 for 4 with a double and Emilio Benavides went 2 for 3 with a walk.